The San Francisco 49ers won an actual football game on Sunday. The Cleveland Browns, meanwhile, did not. Although the Browns led for more than a few minutes in their Week 10 outing, they eventually suffered a road loss to the Detroit Lions. Speaking of road losses, another one ended Butch Jones' tenure at Tennessee and Notre Dame's eliminated it from realistic National Championship contention. Cleveland Browns . Leave it to the Browns to do that. With 15 seconds left in the first half, Cleveland-which had no timeouts remaining-found itself with a 2 nd-and-goal situation at Detroit's two-yard line. Just about the only thing the Browns could not do was get tackled in bounds. So, what do they do? Run a quarterback sneak right into the Lions' defensive line, of course! DeShone Kizer got stuffed and the clock ran out, leaving the Browns trailing 17-10 when the game should have been tied or at worst for Cleveland a 17-13 Detroit lead. The Browns, who once led 10-0, ended up losing 38-24. Thanks to San Francisco's 31-21 defeat of the Giants, Cleveland is now the undisputed worst team in the NFL at 0-9. The Browns are +7.5 home underdogs against Jacksonville in Week 11. Richard Sherman . 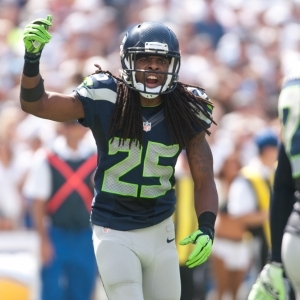 Sherman already despised Thursday Night Football. He will despise it even more now. Playing on just three days of rest, the Seattle Seahawks took care of the Arizona Cardinals 22-16 in last week's NFC West battle. Sherman, however, did not make it through the game; and he will not make it through any other game this season, either. The star cornerback, who has not missed a single game since entering the NFL in 2011, suffered a ruptured Achilles' tendon in the third quarter. He was one of seven players who left Thursday's contest early due to injuries. Seattle is a -3 home favorite over Atlanta next Monday night. Butch Jones . If nothing else, he lasted longer than former Florida head coach Jim McElwain. Finally, though, Jones got the boot from Tennessee following Saturday's 50-17 blowout loss to Missouri. The Volunteers are 1-5 in their last six games, a stretch that also includes a 41-0 humiliation by Georgia, a 45-7 beatdown at the hands of Alabama, and their second loss to Kentucky in the last 33 years. Jones was 3-9 in his last 12 SEC games with UT and 0-6 against SEC competition this season. He is reportedly telling recruits to look elsewhere for their upcoming college careers, and four 2018 commitments had already backed out as of Sunday night. Tennessee is a +15.5 home underdog against LSU this weekend. Notre Dame .Everybody wins when Miami (FL) brings out the turnover. Well, unless you're either an in-state rival who hates the Hurricanes or the particular opponent who is playing against them on any given Saturday. In last week's case, it was none other than Notre Dame. The Fighting Irish went on the road to Miami for a showdown between two teams that were in serious College Football Playoff contention. Make that one now. Notre Dame suffered its second loss of the season as it allowed the 'Canes to bestow the turnover chain upon four different players en route to a 41-8 blowout. Miami is an early +6.5 underdog against Clemson in next month's ACC Championship. Los Angeles Clippers . No team is saddled with a longer current losing streak than the Clippers. They have dropped five in a row to Memphis, Miami, San Antonio, Oklahoma City, and New Orleans. They have not defeated anyone other than Dallas (the worst team in the NBA at 2-11) since a season-opening four-game winning streak from Oct. 19 through Oct. 26. Los Angeles has surrendered at least 104 points in all five of their recent setbacks, including at least 111 on four occasions and exactly 120 twice. At 5-7, L.A. has slumped to 11 th place in the Western Conference standings. The Clippers are -1.5 home favorites over Philadelphia on Monday. Jonathan Bernier . The Avalanche were riding a three-game winning streak until last week happened. Now they have lost three in a row. Colorado fell 6-4 to the Islanders the previous Sunday and 4-3 to Ottawa on back-to-back days in a home-and-home set this past Friday and Saturday (in overtime at home and then in regulation on the road). Memo to the Avalanche: put Semyon Varlamov in goal and leave him there. Bernier allowed six goals against the Islanders and then saw the Senators send four past him. In his last four starts, Bernier has given up a combined 17 goals. He is 2-4 in six games this season with a 3.71 goals-against average and .887 save percentage. Varlamov, on the other hand, is a more respectable 6-3-1 with a 3.18 GAA and .908 SVP. Toccoa Falls . This is not a misprint; this is an actual score: Appalachian State 134, Toccoa Falls 34. That's right; the Mountaineers won their regular-season opener by 101 points this past Saturday. Toccoa Falls, which competes in the National Christian College Athletic Association, shot a horrendous 11-for-69 from the floor (15.9 percent) and watched the Mountaineers go 50-for-80 (62.5 percent). It was the sixth game in history involving a Division I team to be decided by at least 100 points. "I didn't know about records or anything like that," Appalachian State head coach Jim Fox said. "I just wanted to make sure our guys were playing the right way and handling themselves in the right way, and they did that." Toccoa Falls paid a visit to Mercer one day later and lost 110-43. Duke is a +500 favorite to win the National Championship.